Suddenly one of the chief architects of the Bush administration's war on terrorism seems to have doubts about how it is going. At least that is the impression left by a leaked memo to top Pentagon aides from the US Defence Secretary, Donald Rumsfeld. Defence officials are playing down the significance of the memo, which was sent to the Pentagon's top civilian and military leaders last week. They say it is merely Mr Rumsfeld doing what he normally does, probing senior colleagues on major long-term issues. Mr Rumsfeld is notorious for his "snowflake" memos which are meant to drift down to Pentagon staff, carrying the defence secretary's thoughts and concerns. The secretary is a hard taskmaster who requires clear thinking and ideas from his subordinates. The leaked document, however, is not one of those snowflakes but an official memorandum, and so carries even more weight. And it makes some sobering reading that is likely to pose new questions in the US Congress and elsewhere about the Bush administration's policy on its war on terrorism. The tone seems at odds with some of the public statements of Mr Rumsfeld himself and President Bush on how much progress is being made in the war. The memo says, among other things, that Iraq and Afghanistan will be a "long, hard slog", and that the US record against al-Qaeda is mixed. Mr Rumsfeld even suggests that the United States does not have the right mechanisms to know if it is winning or losing the war, whether it is capturing, killing, or deterring more terrorists than are being recruited. One idea Mr Rumsfeld throws out is to create a "private foundation", as he calls it, to entice the madrassa religious schools - which are blamed in the administration for nurturing radical Islamic militants - to take a more moderate course. Such a suggestion, coming on top of the row over the US general accused of disparaging Islam, is unlikely to endear the Pentagon in parts of the Muslim world. 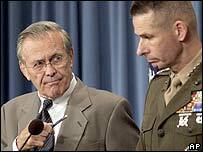 In the memo, Mr Rumsfeld also questions whether the Pentagon is doing enough to adapt itself to the new threats. He argues that it has yet to make what he describes as "any truly bold moves"; that it is not possible to transform it fast enough to fight the new war; and that a new institution, either inside or outside the Pentagon, may be needed. The Pentagon spokesman said the memo was meant to raise "big questions that deserve big thinking". What is not known is what responses, if any, Mr Rumsfeld has had from his staff on these issues. And the memo could well have repercussions beyond the walls of the Pentagon. "Both the White House and the Pentagon have played it down"